This Master's degree is designed to support students in developing into outstanding Strength and Conditioning coaches. 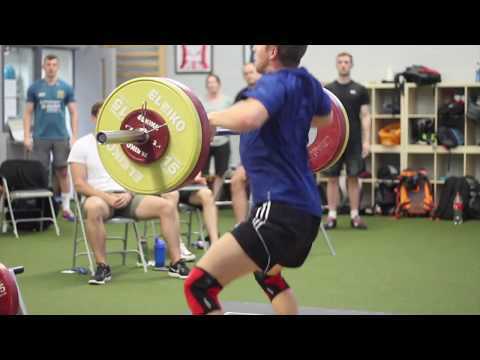 Why study Strength and Conditioning (Distance Learning)? Our Master's degree in Strength and Conditioning has been designed with these demands in mind and aims to support students in developing as excellent strength and conditioning coaches. We're widely recognised as an international leader in strength and conditioning education. We were the first UK institution to offer an undergraduate degree in strength and conditioning, and this Master's programme was the first part-time, distance learning strength and conditioning course in the UK. In recent years the University has invested £250,000 in a state of the art Performance Education Centre, which is unrivalled as a facility for strength and conditioning education. Our staff includes both highly experienced coaches and expert sport scientists. All of the course material is designed specifically for the strength and conditioning degree, ensuring that the practical relevance of the scientific evidence to the strength and conditioning coach is always fully explored. The distance learning nature of this course has several advantages for professionals. Principal among these is the opportunity to combine study with practical work experience, allowing the translation of science into practice. In addition, you can organise your study around your own personal schedule. You can download lectures and watch them at times that suit you. For further information about the degree, please download our pre-entry course information PDF. This PDF is delivered in a similar format to the majority of lectures on the MSc, so will give you a feel for the principal mode of delivery for the course. Please note: the file needs to be saved to your computer before opening and viewing. To play this file you need to have the latest Adobe PDF Viewer, Adobe Shockwave, Adobe Flash and Java installed on your computer. Unfortunately, this file will not play on iPads or iPhones. A 2:2 in an undergraduate degree, preferably in Sport Science or a related field. Experience in the strength and conditioning field amounting to at least ten hours per week is also required. This can be either paid or voluntary work. Some flexibility in requirements is possible for those achieving lower degree classifications where they can demonstrate substantial industry experience and that their current commitment to study has progressed from the time of their first degree. At least five years of experience working in sport in roles related to physical preparation of athletes. Full-time employment and at least five years of experience in a role relating to the physical preparation of military personnel. Suitability for non-degree entrance is assessed through the completion of two entrance essays that should be completed and submitted along with your application. Details of the entrance essays can be downloaded here. If you're offered a place on the non-degree entrant's pathway, you'll be restricted to two modules in your first year (meaning that the quickest you can complete the degree is in three years). In addition, you will study a non-credit bearing study skills module designed to help you quickly upskill in the areas necessary for Master's level study. This module is designed to help students understand and critically evaluate the technical aspects of, and rationale for, the principal techniques used in strength and conditioning. In addition students will reflect on aspects of professional practice. This module will equip students with the necessary tools to independently examine scientific literature, critically evaluate information, make judgements based on incomplete evidence and understand the scope for evidence to inform practice. The module will permit students deep understanding of the complexities of research design, data collection, analysis and dissemination and the extent to which these issues influence the meaning and value of evidence. The aim of this module is for students to critically evaluate the application of biomechanical and skill acquisition principles and evidence to strength and conditioning practice. Provide the student with advanced theoretical knowledge and understanding of the physiological consequences of athletic training and how this information may be applied to enhance specific performance characteristics. This module will critically evaluate the principal issues in designing and monitoring strength and conditioning programmes for enhancement of sports performance. This includes a multidisciplinary approach to programme design and evaluation. The aim of this module is to develop a broad and critical understanding of the wider areas of knowledge and current research that may have a direct impact on athletic performance and consequently also strength and conditioning practice. In this module students will apply advanced independent critical thinking to a specific topic in strength and conditioning, permitting the development of new knowledge. To provide students with the requisite knowledge and skills to plan and design an original high quality research study independently and communicate the findings to others. Please note: this is a core module for MSc students, but is not available to PGDip and PGCert students. In today’s marketplace, employers are seeking to employ staff who are suitably qualified to undertake their roles and responsibilities. As such, there is an increased need for postgraduate programmes to be vocationally orientated, with an emphasis on training students in the theoretical underpinnings and relevant practical areas to work in the sport industry. The MSc / PG Diploma programme focuses on disciplines pertinent to the field of strength and conditioning. The programme has been designed to reflect the competencies required for professional accreditation with the UKSCA and NSCA. It is necessary for applicants to understand that the most important quality valued by employers is experience. It's therefore, a condition of entry to the course that students arrange experience opportunities in strength and conditioning prior to entry. For those using the course as CPD for another career pathway (e.g. physiotherapists) this condition does not apply. Course content is delivered via online lectures and online reading. Students are also required to take part in online discussions and regular video posting is also a requirement to encourage the development of practical and coaching skills. Each module ends with an on-site period where face-to-face content is delivered (including practical skills, laboratory work and assessments). The programme makes an extensive use of non-traditional assessment methods, alongside more traditional methods of assessment. Non-traditional modes of assessment include the posting of video blogs, practical coaching vivas, lab report (timed) and production of a website. Traditional modes of assessment include essays, case studies, presentations and viva voce examination. The course is predominantly delivered as distance learning, however, attendance at the on-site inductions at the start of September is mandatory. In addition, there is a summer on-site at the end of June that is also compulsory - this typically requires 7-10 days attendance in your first year (but is dependent on how many modules you are taking). This outstanding course helped me to get a much deeper understanding of coaching fundamentals and improved my coaching practice. The unique combination of challenging scientific details and insightful practical experiences from the lecturers developed my critical thinking abilities and enabled me to deliver the highest quality of training. Studying in a foreign language was a huge challenge and very time consuming, however every minute spend on the course was more than worth it. Further, besides the compulsory coursework there is plenty of information available for foreign students to improve their writing abilities. I would recommend this course to everybody all around the world who wants to be challenged in their views and improve as a strength and conditioning coach. The course has been a perfect fit for me. The combination of practical applications and assessments - you actually have to lift and coach - as well as the scientific background has been amazing. Entering the program via the non-degree entrance pathway has made it challenging but there is all the support available if you are willing to put in the work. Since you only have to travel to London once per year but may also attend 2-3 times, it is flexible and affordable for international students, which is truly reflected in my current peers. Ranging from Singapore to Canada I have had great conversations (and beers) with many interesting people who have backgrounds from training Olympians to Formula 1 drivers. If you are looking for a challenging and serious degree with high flexibility and close to the actual sports and performance world - you found it. I am looking forward to my second year on the course! The MSc in Strength and Conditioning Science has enabled me to develop and deliver my own philosophy in strength and conditioning with confidence. This is because the knowledge taught, the experience of the lecturers in the field and the opportunities at St Mary's is without doubt second to none. My work within the EIS would not be at the standard it is today without the applied and thought provoking teaching styles. I would recommend this course for anyone seeking to work at the front end of elite sport, or who wants to understand and deliver the highest quality of training. This was the only course I wanted to take and it certainly didn't disappoint! You have to be very organised, but with the right approach to lectures and assignments - and with communication on the forums - you can make major strides as an individual and as a coach. My S&C network has doubled as a result of this course and it was great to have a large cohort to communicate with. I've left with not only a greater knowledge base, but also more confidence in my own ability, coaching and communication skills. I graduated in 2004 with a BSc in Physiotherapy from the University of Malta and have always had a passion for sports. Having played numerous sports disciplines myself and also represented my country, I was eager to learn more about the physical preparation of athletes so that I could play an active role in developing future athletes in my country. After having read the course content and seeing how flexible it was to plan modules to be able to fit in with my work, I chose to follow the Masters degree in S&C at St Mary’s via distance learning. The course is very detailed - and although demanding at times - it's very well thought out by key lecturers in the field and definitely recommended. As an international student on the St Mary’s MSc in Strength & Conditioning, I have come to value the truly international educational experience that St Mary’s has to offer. The content and delivery is world class. Learning in this unique environment and during summer on-site periods, I have developed a close connection with professors and peers from around the world. Classmates with strong backgrounds in rehabilitation have been valuable resources for various questions over the last couple of years. Additionally, I've been host to visitors from Asia coming to Vancouver; and I will similarly look to visit my peers in their parts of the world as well. Overall, it has been a profound experience to meet, network and collaborate with the robust collection of great minds enrolled in and delivering the St Mary’s MSc in Strength & Conditioning program. Working full-time I was searching for an MSc which was flexible in its mode of delivery and this degree ticked all the boxes. The course filled a number of gaps in my existing knowledge and challenged a number of beliefs I had within strength and conditioning. In turn I am able to think more critically about my coaching practice and am better rounded as a result. Equally I feel the course has enhanced my career progression and I wouldn’t hesitate in recommending this degree to any strength and conditioning coach. Having already started a career in professional strength and conditioning with London Wasps prior to commencing the MSc, I was hoping that St Mary's MSc Strength and Conditioning programme would be stimulating, thought provoking and a challenge to my current philosophy. In all honesty, it did more than that and I can definitely say that this programme has raised my strength and conditioning practices to the next level. In the Netherlands no such course exists. All modules or essays of St Mary's have a direct link with some practical theme - whether it is a sport to analyse or a sport movement to consider. In the Netherlands movement sciences is very scientific (and very interesting), but without any practical approach. The module about programming doesn't exist for instance. Other Dutch courses that have a more practical approach are of lower level or are more pedagogic oriented (teachers' physical education). The quality of lectures and resources were perfect and although the course is distance based the online services and access to literature made this easy. A great course for me as it allowed me to study and work within the same environment at the same time. The course is highly challenging which is driven by the lecturers and also by the students through online discussion and the most important outcome for me from this course was the ability to challenge current strength and conditioning practice and have a greater understanding of the scientific underpinning of this field. After extensive research into strength and conditioning masters programmes, I chose St Mary's, because I felt no other academic institution offered the same level of both theoretical and practical content along with global prestige - whilst also allowing me to continue working in my current role. Furthermore, this gave me the opportunity to apply the theoretical knowledge I gained from St Mary's on a day to day basis with my athletes. Finally, the opportunity to liaise and network with fellow S&C coaches from across the globe at the summer onsite allows St Mary's students broaden their horizons and make like-minded friends and contacts worldwide. I have found the MSc at St Mary's excellent as a course and it combines academic theory and practical coaching very well. The flexible option of learning through a modular format reinforces the learning and allows for students in full-time employment to pursue an internationally recognised qualification. Additional costs could be incurred depending on optional modules chosen and other projects undertaken For further information about additional costs please contact strength@stmarys.ac.uk. Nevin, J., Waldron, M., Patterson, S., Smith, P., Price, M., & Hunt, A. (2018). The efficacy of an 8-week concurrent strength and endurance training programme on hand cycling performance. Journal of Strength and Conditioning Research, in press. Hattersley, C., Wells, C., Blagrove, R., Trangmar, S., & Patterson, S. (2018). Impact of fixture congestion on indices of performance and recovery in youth soccer players. Sport Performance and Science Reports. Czasche, M. B., Goodwin, J. E., Bull, A. M. J., & Cleather, D. J. (2018). The effects of an eight-week strength training intervention on tibiofemoral joint loading during landing: A cohort study. BMJ Open Sport and Exercise Medicine, 4, e000273. Parr, M., Price, P. D. B., & Cleather, D. J. (2017). Effect of a gluteal activation warm up on explosive exercise performance. BMJ Open Sport & Exercise Medicine, 3, e000245. Veness, D., Patterson, S. D., Jeffries, O., & Waldron, M. (2017). The effects of mental fatigue on cricket-relevant performance among elite players. Journal of Sports Sciences, 35, 2461-2467. Fox, R., Patterson, S. D., & Waldron, M. (2017). The relationship between heart rate recovery and temporary fatigue of kinematic and energetic indices among soccer players. Science and Medicine in Football, 1, 132-138. Cushion, E. J., Goodwin, J. E., & Cleather, D. J. (2016). Relative Intensity Influences the Degree of Correspondence of Jump Squats and Push Jerks to Countermovement Jumps. Journal of Strength and Conditioning Research, 30, 1255-1264. Jolley, R. I., Goodwin, J. E., & Cleather, D. J. (2016). Peak power output in the bench pull is maximised after 4 weeks of specific power training. Journal of Strength and Conditioning Research, 30, 966-972. Wood, P. P., Goodwin, J. E., & Cleather, D. J. (2016). Lighter and heavier initial loads yield similar gains in strength when employing a progressive wave loading scheme. Biology of Sport, 33, 257-261. 2014: Jonathan Jacobs: The body image of the strength and conditioning coach: Are aesthetics important? Start your application to study Strength and Conditioning (Distance Learning).